Introduction: Gena Philibert-Ortega is a genealogist and author of the book “From the Family Kitchen.” In this guest blog post—in celebration of November being Native American Heritage Month—Gena searches old newspapers to find stories about U.S. First Lady Edith Wilson and her connection to her famous Native American ancestor, Pocahontas. When we think of great Native American leaders throughout U.S. history, names like Cochise, Geronimo, Crazy Horse and Sitting Bull come to mind. But what about Native American women? Most Americans know the names of only two Native American women: Pocahontas and Sacagawea. Pocahontas, whose mythology was immortalized in a song sung by Peggy Lee and a Disney movie, might be the most familiar Native American woman because she left a sizable number of descendants through her son Thomas Rolf. One American whose Pocahontas lineage was well reported was Edith Bolling Galt Wilson, the second wife of U.S. President Woodrow Wilson. From the time she became engaged to the president, her family history was a frequent topic in the newspapers. Photo: Edith Bolling Galt Wilson. Credit: Woodrow Wilson Presidential Library. In writings about Boiling family history, emphasis was placed that someone with “Indian blood” would now reside in the White House. This announcement about Edith’s lineage was also the catalyst for impromptu history lessons found in newspapers across the country. The short life of Pocahontas has been retold often, and—as with any well-told story—inaccuracies creep in. 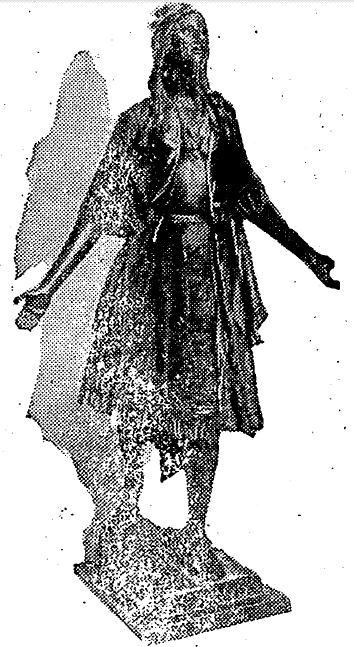 This old newspaper article provides readers with information and images reportedly of Pocahontas. 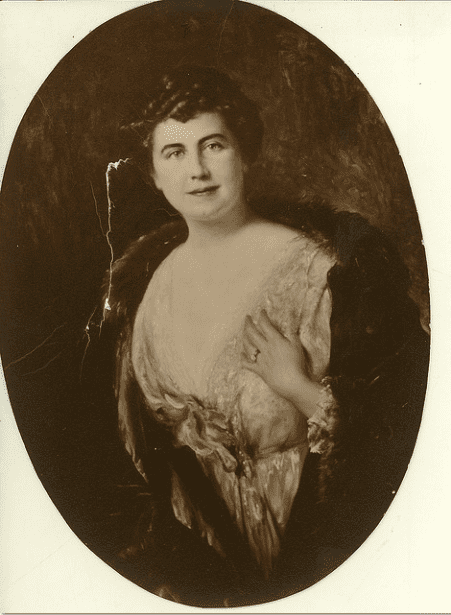 The widow Edith Bolling Galt married President Woodrow Wilson in December 1915. Undoubtedly, any presidential wedding results in gifts from a diverse range of well-wishers. The Wilson wedding was no different. 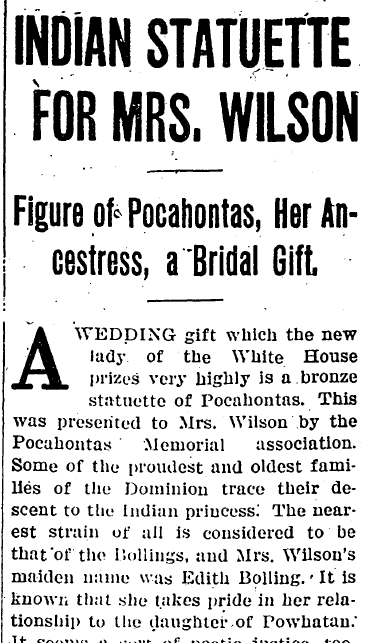 According to this 1916 newspaper article, one item that Woodrow Wilson’s wife received was a Pocahontas statuette presented by the Pocahontas Memorial Association. 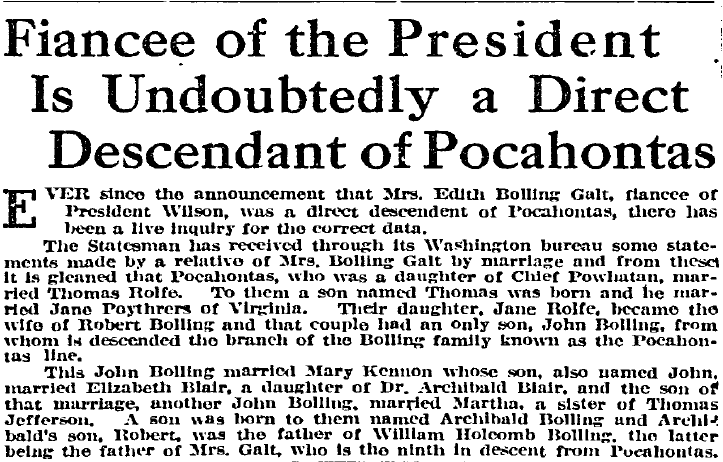 The article points out that Edith Galt Wilson was related to Pocahontas through her paternal line. The news article included this picture of the Pocahontas statuette. 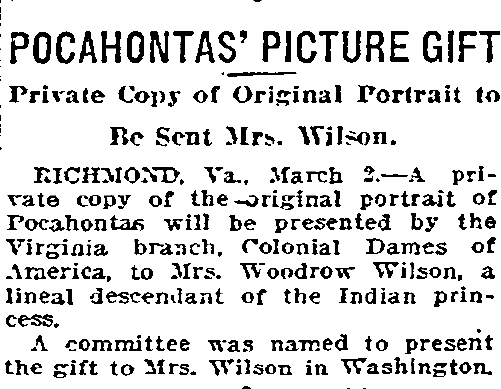 The statuette was not the only Pocahontas-related gift that Edith received while in the White House. Other gifts related to her Native American ancestry included dolls and a portrait of her ancestress presented by the heritage membership organization Colonial Dames. 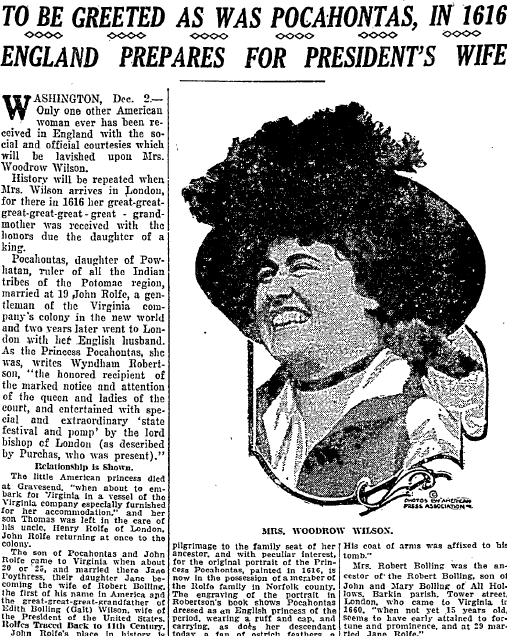 When Edith Wilson visited England in 1918, this Duluth newspaper article heralded the visit of a descendant of Pocahontas—pointing out it was a little over 300 years since her ancestor made a similar trip. 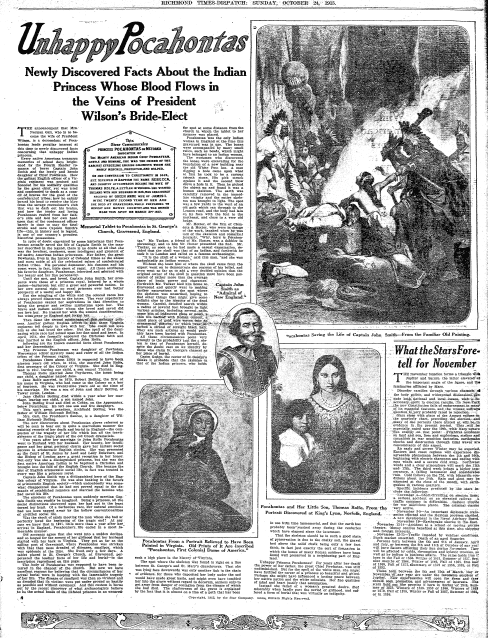 The newspaper article claims: “Only one other American woman [Pocahontas] ever has been received in England with the social and official courtesies which will be lavished upon Mrs. Woodrow Wilson.” The news article goes on to trace Edith’s roots to Pocahontas and even to her early Bolling family tree. Are you a descendent of Pocahontas? You may be interested in the book Pocahontas’ Descendants: A Revision, Enlargement, and Extension of the List as Set Out by Wyndham Robertson in His Book Pocahontas and Her Descendants (1887), by Stuart E. Brown, Jr., Lorraine F. Myers, and Eileen M. Chappel (the Pocahontas Foundation, 1985). Gary B. Roberts’ article Notable Kin: Some Descendants and Kinsmen of Descendants of Pocahontas: An Excursion into Southern Genealogy on the American Ancestors website has additional sources you may be interested in. Whether or not you have Native American ancestry, dig into GenealogyBank’s historical newspaper archives to find out more about your ancestors, discovering the stories that help fill in the details on your family tree. *Notable Kin: Some Descendants and Kinsmen of Descendants of Pocahontas: An Excursion into Southern Genealogy by Gary B. Roberts. American Ancestors. 1986. http://www.americanancestors.org/an-excursion-into-southern-genealogy/ accessed 11 November 2013. I hope you can help. For a few generations we’ve been told our Great Grand Mother (many times over) was Pocahontas(Rebecca Rolfe), and Great Grandpa was Thomas Rolfe. I’ve been researching; not knowing where to start. Then ran into this. I did know it was possible one of our Great Grand Mothers may have been a First Lady of the United States. Oh, Gena! I can barely breath. Are you able to help my family research this, or give me leads as to what to do next? You’ll first want to trace that family line you believe to be descended from Pocahontas starting with you and going backwards. Make sure to gather original records (vital records, etc) that prove each generation. By carefully tracing back each generation you can either prove or disprove your connection. I provided some resources in the article for continued research but make sure you start your own careful research first and then prove that you are connected to the Bolling line. I am an 11th-generation descendant of Pocahontas. My Grandfather was Samuel Monroe Wadsworth Senior. My daughter, whose last name is Hayworth, found a lineage connection with Edith Wilson. I wonder how to confirm this information.